At Gleeson College, I believe we have the support, structures and opportunities to assist all students to develop as an individual and achieve their best personal results. Gleeson College is a faith-filled community, providing our students and staff with the opportunity to discover, develop and use their God-given talents in the service of others. We aim to foster and encourage all students to strive to be the best they can academically, socially and as a person for the world. Situated on the One+ Campus, Gleeson is particularly well resourced and is complemented by our unique and outstanding shared learning concept. Gleeson College was established in 1989 and is named after the late Emeritus Archbishop of Adelaide, the very Reverend James Gleeson. Archbishop Gleeson had a strong personal commitment to the pursuit of excellence, justice and peace, and we believe that the students of Gleeson College continue to strive for those goals in our Catholic tradition. The intertwining crosses of our College Logo symbolise our sharing with Christ in a reflection of community, and our relationships with Partner Primary Schools and our One+ Campus schools. Our College Motto 'With One Heart' continues the theme of our belonging together, with and in Christ. Our mission is to always be a College of quality learning and quality teaching. We also aim to work in close partnership with our students and parents, in order to achieve success for all. 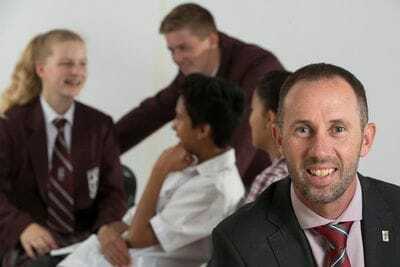 The College operates a Vertical House Structure (VHS) of Pastoral Care, with House Care Groups including Year 7-9 students in the Middle School, and Year 10-12 students in the Senior School. We are continually observing the positive outcomes of the VHS implementation, including increased College Spirit and improved student relationships and sense of belonging over all year levels. Gleeson College is a faith-filled community that provides its members with the opportunity to discover, develop and use their God-given talents and abilities in the service of others. At Gleeson College, all members of our community aim to fulfil the College's Vision through our ten core values known as the Gleeson 10 and our staff commit to working together through the Gleeson Staff 5. We believe that excellent pastoral care allows students to thrive and is an important precursor to learning well. Therefore, we are committed to the "Heart of Pastoral Care": Peace and Harmony, Dignity and Respect, Compassion, Truth and Justice. At Gleeson College, we are dedicated to excellence in learning and teaching and so we commit to the "HEART of Learning and Teaching". That is, where learning and teaching are Holistic, promoting Engagement, seeking Authenticity, building Resilience and fostering Teamwork. We live in a world where life-long learning is paramount to developing capable, skilled and thriving people who are able to use their talents and abilities to their fullest potential. It is our role to know our students well, tailor our teaching to their needs and build their resilience in an ever-changing world. We acknowledge and promote collaboration and engagement in authentic learning. Ultimately, we aim to produce young people of One Heart - deeply united, thriving, learning and leading in the world God desires. We look forward with hope and joy to the contribution our graduating students will make to the world. I invite you to explore our website and learn more about our wonderful College Community. I wish you and your family every blessing.